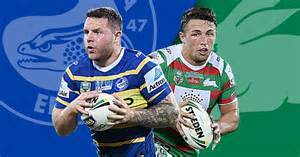 South Sydney Rabbitohs 26 defeat Parramatta Eels 20. It was a battle of desperation for both clubs, as Rusty's men were hoping to pick themselves up after last weeks loss and keep themselves in the Minor Premiership race. The Eels on the other hand were fighting to avoid the wooden spoon. with both the Cowboys and Bulldogs getting upset wins and going 2 point clear of the cellar dwellers, the Eels heavily relied on a good performance in this game to keep up. The first 15 minutes showed us that the Rabbitohs weren't having a repeat of last week, however it also showed that the Eels weren't here to get beaten easily, and that they were here to bring that fight to the other teams in spoon contention. South Sydney were able to strike first when a beautiful set piece allowed Dane Gagai to go over untouched and give the Bunnies an early lead. However momentum was quick to change when a roll on of penalties marched the Eels down into brilliant attacking position. After a few offensive sets and a Hymel Hunt sin bin for the Bunnies in 26th minute, the Eels were able to go over when a Corey Norman corner chip was left to bounce and dived upon by Clint Gutherson. The Eels were able to extend their lead roughly 5 minutes later when big boy Peni Terepo took on the line before delivering a short ball to Jarryd Hayne who went flying through the line and took off down field for a quick 12-6 lead with under 10 minutes remaining. Parramatta were able to extend their lead in the dying minutes of the half when an attacking set on the last tackle was shut down by Souths when the ball went out to Michael Jennings who was wrapped up and looked to have handed the ball over. Amazingly but, the defence let Jennings go thinking the tackle was complete, in which Jennings ran over to score in the corner and give the Eels a 12 point lead going into half time. South Sydney came out of the sheds with the intent to lift their intensity and it showed. Despite a lucky break no try to Jarryd Hayne on an intercept run away and a penalty goal by the Eels, the Rabbitohs were showing the want and were putting severe pressure on the Eels with almost 20 minutes of continuous pressure. The pressure finally became to much and the Bunnies were able to run a set piece play that allowed Campbell Graham to go over in the corner and cut into the Eels lead. Only a few minutes later, another set piece gave the Rabbitohs the overlap, but this time on the opposite side which saw Robert Jennings grab the 4 pointer the cut into the Eels lead even more to make it just a single try differential. Only a few minutes later we saw Corey Norman get sent for 10 for to many team penalties on their line. This added even more pressure onto the Eels and South Sydney took full advantage of it when Dane Gagai found space and went one on one with the Eels fullback which saw the Rabbitohs centre pick himself up a double and the lead for the Bunnies. With only 10 minutes remaining the Rabbitohs were looking strong while the Eels were struggling to find an answer to the dominance shown by South Sydney in the second half. Despite a valiant first half effort, the Eels were unable to come back and a late set piece try for Campbell Graham to grab a double gave the Rabbitohs a 26-20 win.